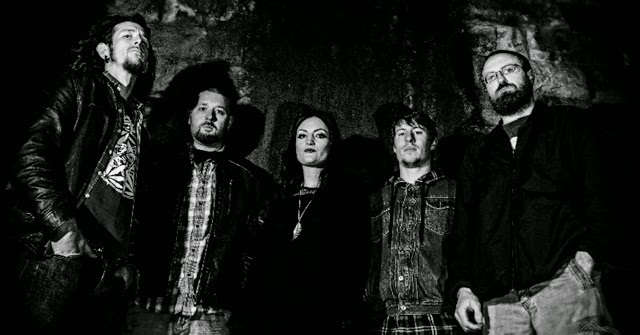 After the great feedback received across the board for their debut EP “Euphoric Curse“, Sunderland (UK) based Stoner/Doom/Metal outfit WITCH CHARMER follow it up with their first full length record raising the bar on what came before. The band (featuring the talents of Kate McKeown - Vocals, Dave McQuillan - Drums & Vocals, Len Lennox - Guitar & Vocals, Adam Clarke - Guitar & Vocals, Richard Maher – Bass) expands on the sound from their previous release and add a monolithic slab of smoked out doom and groove to take you on a satirical journey to enlightenment. “The Great Depression” has been mixed and mastered by Tony Reed (Mos Generator, Stone Axe) and will be released by Argonauta Records in September 2014. Check out their 2013 release, "Euphoric Curse"